Hello Autumn, it has been a while! Summer's over and Autumn is well and truly here which means saying goodbye to my wardrobe of cute little dresses, summer sandals and co-ord sets. Now that the weather is getting colder, that means my uniform of jumpers, jeans and boots are back. I love a roll neck especially, as they're super comfy, keep my neck warm but also make an outfit look 'put together' when in real life, it took me two minutes to decide what I'm wearing. 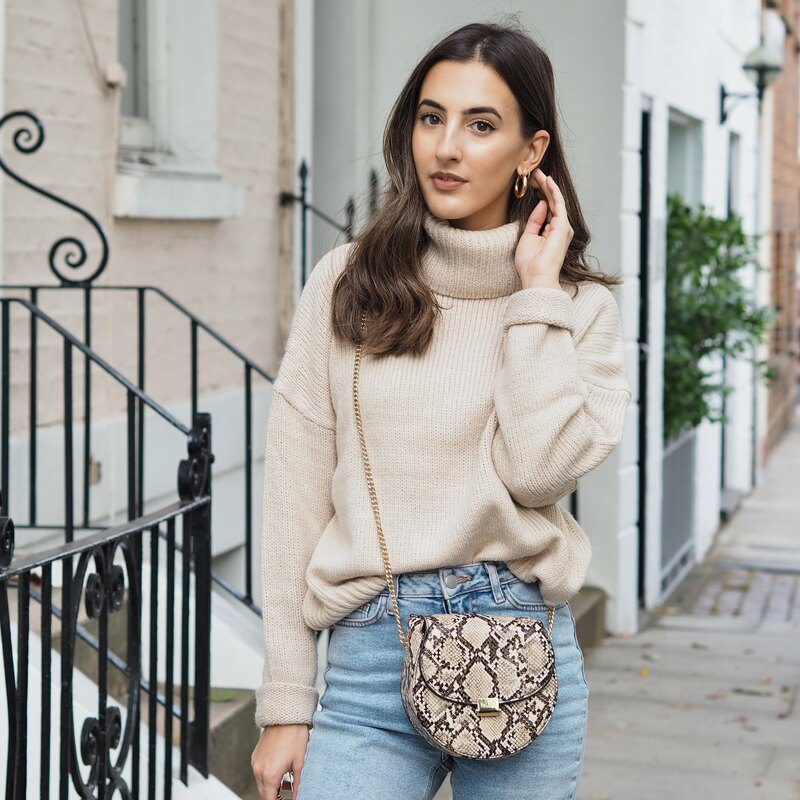 This jumper from Nakd Fashion is the perfect cosy wardrobe addition, I love the slouchy style of this and it's not too thick so essential for these Autumnal months. I haven't got anything from Nakd Fashion before and I was so impressed with this little jumper. I know I'm going to wear this to death this winter as it's the perfect colour for everything in my wardrobe. I also love how it matches this Snake Skin Bag from Mango perfectly. Add some straight leg jeans like these Primark ones (£13 bargain btw!) and some ankle boots and you're good to go. So it has been a while since I wrote a post on here! The last few months have been crazy, and whilst I have been active on Instagram (although not as active as I'd like to be! ), this blog has taken a little back seat. However, I want to start taking more time to write these blog posts and to show my outfits like I have done for so long! 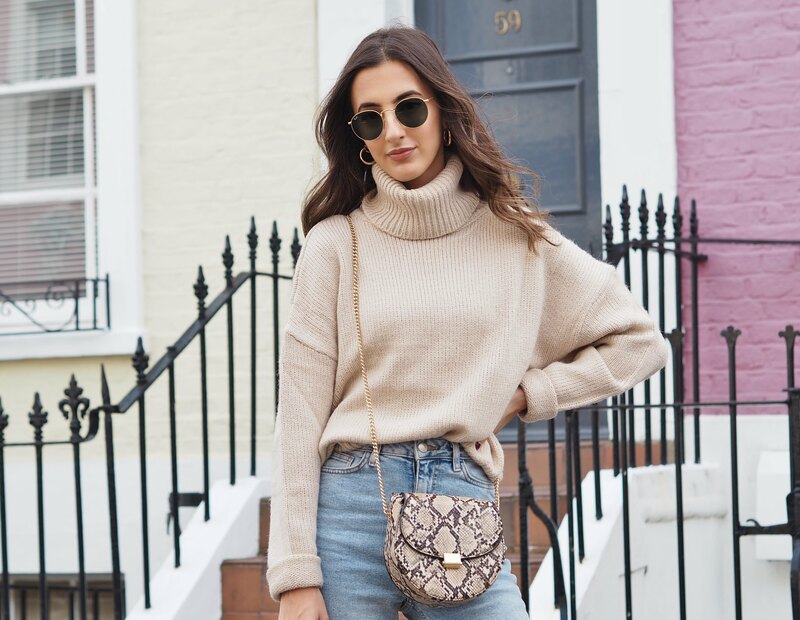 It's been SO cold and miserable in London at the moment, I am well and truly over my everyday uniform of a jumper and jeans. 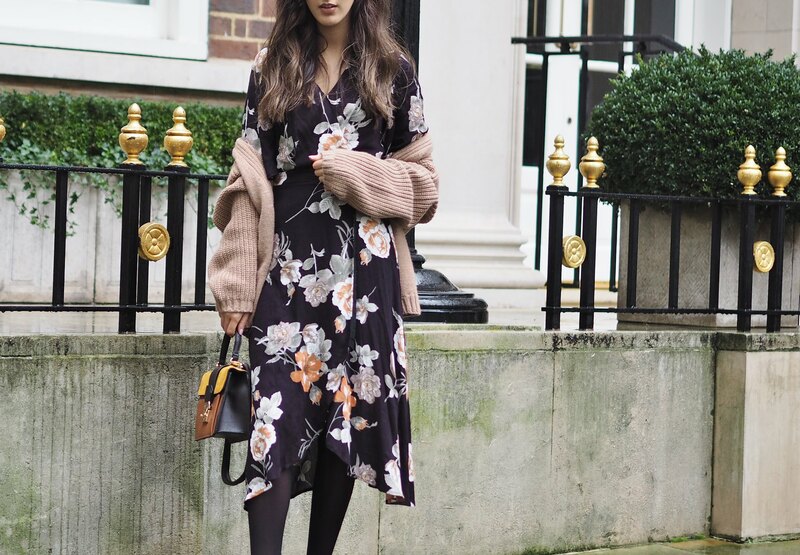 This beautiful floral dress from Tobi is a new addition to my winter wardrobe. I chose it because I can layer it during the winter months like I have with my ASOS cardigan, tights and leather boots, but it will also be perfect for Spring and Summer with some sandals and sunnies. As it's a wrap dress it's super comfortable and even though it was raining whilst taking these shots, I still didn't feel freezing. So I'd definitely recommend this! What's your staple piece for Winter?